If you have NDIS questions that are not covered by the following frequently asked questions, please contact our Community Engagement Team or book in for a free one-on-one discussion. The National Disability Insurance Scheme (NDIS) is designed to empower people with disability to work towards achievements, to identify the disability related support they need to meet their goals, and to choose where they would like to buy their supports. Find out more about the NDIS and what it means for you. all Australians, by providing a safety net for anyone who acquires a disability in the future. What services and support can people access under the NDIS? The NDIS will provide funding for ‘reasonable and necessary’ support, services and equipment to assist a person to achieve their goals. This NDIS is being rolled out across Victoria until 2019. No, the funding under the NDIS is not means tested. Support is related to a person’s disability and the supports they need, not their capacity to pay for support. What does the NDIS mean for my carer? The NDIS acknowledges that families and carers need support so the person with disability has the support they require and family and carers can live their lives. provision of equipment or technology that increases independence and reduces reliance on others. NDIS plans focus on the whole of life support a person requires, this includes maximising outcomes for the person, their family and carers. Are there set package amounts for NDIS plans? No, there are not set package amounts. A NDIS plan aims to give people the supports they need to be as independent as possible, reducing their need for support over time. The cost of the package is determined only by what is included in it. This might change each time a person gets a new NDIS plan. The NDIS funds the reasonable and necessary disability related support that participants require to meet their needs and achieve their goals. What does 'reasonable and necessary' support mean? The NDIS doesn’t cover support that isn’t related to your disability or is an everyday living expense. It also doesn’t replace funding that is more appropriate from other sources such as education, health or transport. These supports will continue to be funded as they are now. Find out more. Will I get the same level of support as I get now once I get the NDIS? A NDIS plan is based on goals, and supports will only be funded if they are reasonable and necessary supports that will help you meet these goals. You should talk about the supports you have and need in your planning meeting. To make the most of your NDIS planning meeting, it’s important to get prepared, including understanding what you receive now and any additional supports you might need. Yooralla has an activity planner in our guide to prepare for the NDIS that you can use to help you to write down all the things you want included in your NDIS plan. Does the NDIS fund education? Depending on your goals, the funding in your NDIS plan may include capacity funding which supports skill building, training, learning, capacity building, accessing employment, improving health and wellbeing and support coordination. Medication is not usually funded in NDIS plans. Medication falls under the responsibility of the health system and therefore would not be an NDIS funded item. Under the NDIS, the Centrelink Mobility Allowance is replaced by funding for transport needs related to a person’s disability in their individual NDIS plans. Make sure that you think about your transport support needs when you prepare for your NDIS planning meeting. Transport support might include funding for taxis or buses, or travel training to build your skills and reduce the need for support in the future. The NDIS does not fund everyday expenses such as public transport (e.g. Myki). Yes, as long as the equipment is a reasonable and necessary support to help you achieve your NDIS goals. Assessment to identify the appropriate equipment or technology, writing reports and prescriptions, the equipment purchase itself and fitting of equipment when delivered may all be funded by the NDIS. You will also need to consider repairs and maintenance of equipment and whether people working with you will require special training to use the equipment or technology. The aids and equipment planner in Yooralla’s free guide to prepare for the NDIS can help you work out your equipment needs before your planning meeting. Does the NDIS fund accommodation? Specialist Disability Accommodation (SDA) is housing that helps people with very complex needs to live as independently as possible. So, whether or not a person will qualify for SDA funding will come down to their individual NDIS goals and needs. Any support would need to be specific to a person’s goals in their NDIS plan, and be considered reasonable and necessary support. You should discuss accommodation options with your planner. Depending on a person’s goals, under the NDIS, temporary supports that are different from usual arrangements, such as respite, may be funded under ‘Short-Term Accommodation’ (STA) which is a core support. This may include short stays in a group facility (Short-Term Accommodation) or additional in-home support. Find out more about Yooralla’s respite service. How and when can I access the NDIS? Eligibility for the NDIS depends on where you live and the nature of your disability. What happens if I am aged over 65? People aged over 65 currently accessing funded disability support will continue to receive support under legislated continuity of support agreements, unless they choose to move across to aged care or health services or support. People who acquire a disability after the age of 65 are not eligible for the NDIS and will be supported by aged or health care services, consistent with current arrangements. Eligibility for the NDIS depends on factors such as whether a person lives in a NDIS transition area, and the nature of their disability. Find out more about how you can find out if you are eligible for the NDIS. A NDIS plan outlines a person’s goals and the disability related services and support that will help them to achieve those goals. It describes the funded supports they will receive from the NDIS. Yooralla’s free guide to prepare for the NDIS can help you to prepare for your planning meeting, so you can make the most of your NDIS plan. What should I prepare for before my NDIS planning meeting? To make the most of your NDIS plan you need to prepare for your planning meeting. Yooralla’s free guide to prepare for the NDIS can help you to prepare. Planners are staff nominated by the NDIS who work with you to identify your goals and the supports you need to achieve your goals. These could be called NDIS planners or Local Area Coordinators (LACs). The planner will contact you to arrange a time for your NDIS planning meeting. At the planning meeting they’ll work with you to create an individualised NDIS plan by asking questions about your life. What if I am not happy with my NDIS planner? You have the right to provide feedback to the NDIA about your planner, and if you do not feel comfortable with your planner, you can ask the NDIA for another person to work with you instead. How can I get help to understand my NDIS plan or the planning process? Yooralla is holding one-on-one sessions to help you to understand what’s in your NDIS plan. Before you get your NDIS plan, we can also help you to prepare for your planning meeting in a one-on-one session. Can I change my NDIS plan? Yes, only if your needs or circumstances change significantly, you can ask to review your plan earlier than the usual 12 month review period. The NDIS or a LAC can help you through the process to request a change to your plan. A significant change where you could contact the NDIS and ask for an early review might be if your parent cares for you and they need to go to hospital for a while, and won’t be at home to support you, so alternative funded support is required. How long does a NDIS plan go for? Although NDIS plans usually run for 12 months, you can ask for a shorter NDIS plan if you think your needs might change significantly during that time. Or you can ask for a longer plan, say for two years, if you think your needs will stay the same. With about six weeks in a NDIS plan, the participant is contacted for a plan review process to work on their next NDIS plan. Plan reviews are important in making sure you get the support you need to achieve your goals. It will help ensure your NDIS plan continues to meet your needs as they change. To book a free one-one-one discussion with Yooralla to help you prepare for your plan review meeting, email ndis.infohub@yooralla.com.au or call 03 9666 4500 to let us know of a date and time that suits you. What happens in a NDIS plan review? A NDIS plan generally runs for 12-months, so with about six weeks to go participants undertake a plan review process to work on their next NDIS plan. A representative from the NDIS, possibly the person who helped develop your first NDIS plan (maybe a Local Area Coordinator) will contact you to start the plan review process, and development of your second NDIS plan. The plan review discussion may not be as long and detailed as your initial NDIS planning discussion. However, it’s still worth giving some thought before your review discussion as to how your first NDIS plan has gone for you. Plan reviews may happen face-to-face or by phone. Yooralla’s free guide to making the most of your next NDIS plan can help you understand the process for your next NDIS plan and how you can prepare for your plan review meeting. It includes a meeting planning tool. Who can support me in my NDIS Journey? How can Yooralla support me under the NDIS? Yooralla can support you to prepare for your NDIS planning meeting, to help you to make the most of the NDIS. We can also help you understand and implement your NDIS plan once you receive it. Our Community Engagement team can answer your NDIS or Yooralla questions no matter what stage of your NDIS journey you are at. When you receive your NDIS plan, Yooralla can support your NDIS goals with our wide range of tailored, flexible and quality services. We are a disability specialist and we know the NDIS – we have been supporting participants from the beginning of the NDIS. Find out more about how Yooralla can support your NDIS goals. A Local Area Coordinator (LAC) is someone who will work with many NDIS participants to confirm or assess their eligibility, undertake NDIS planning, and review supports in NDIS plans when they are reviewed. Who are the Local Area Coordinators (LACs) in each area? In North East Melbourne, Hume Moreland and Bayside Peninsula the Brotherhood of St Laurence is providing Local Area Coordinator (LAC) services. The Brotherhood of St Laurence supports people to access the NDIS or access community and mainstream services. In the Loddon region, Intereach is providing Local Area Coordinator (LAC) services. Intereach supports people with disability in Campaspe, Central Goldfields, Greater Bendigo, Loddon, Macedon Ranges and Mount Alexander, to access the NDIS or access community and mainstream services. You can contact the Intereach team by phone, email or visiting one of their offices. In Central Highlands, Ovens Murray, Wimmera South West, Barwon, Inner East Melbourne, Inner Gippsland and Outer East Melbourne, Latrobe Community Health Service is providing Local Area Coordinator (LAC) services. Latrobe Community Health is supporting people with disability in these areas to access the NDIS or access community and mainstream services. Who can support me in the NDIS planning process? When you start your NDIS journey, it’s a good idea to identify whether you need support for the process. If you do, then think about a person who knows you well and who can assist you to prepare for your planning meeting. You might also want to ask them to attend your planning meeting with you. This person might be a family member, friend or an advocate – someone who knows you well, can provide some background about your needs and can make sure the planner gets the right information about you, your goals and needs. Yooralla is holding one-on-one sessions to help you to prepare for the NDIS. Yooralla has also developed a free guide to prepare for the NDIS which can help you to get ready for your planning meeting. Who can support me to use the funded supports in my NDIS plan? When you go through the planning process with the NDIS, let them know if you need some support to implement your plan. There are three levels of Support Coordination that you may be funded for in your NDIS plan. Yooralla can also support you when you get your NDIS plan. We are holding free one-on-one sessions to help you to understand what’s in your NDIS plan and we have produced a free guide to implementing your NDIS plan. Yooralla can support your NDIS goals with our wide range of tailored, flexible and quality services. We are a disability specialist and we know the NDIS – we have been supporting participants from the beginning of the NDIS. 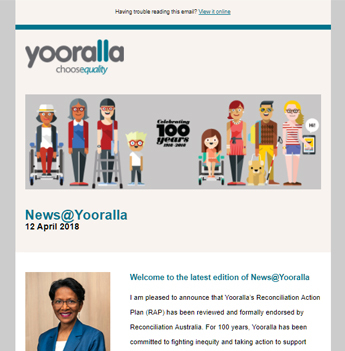 Find out more about how Yooralla can support your NDIS goals. What are the ways I can manage my NDIS plan? What are the ways to manage the funds in my plan? Can I self-manage my NDIS plan? Yes, you can self-manage your funding under the NDIS. This is a decision you need to make before your planning meeting, as the planner will ask you how you want your plan managed. If you self-manage your NDIS funds, you need to pay the service providers yourself, and keep your own records. The NDIS have resources that can help you to self-manage your plan. Can I directly employ my own staff? If you self-manage your NDIS funding you can employ anyone, even if they’re not a NDIS registered provider - but you need to ensure that you make arrangements for insurance and staff entitlements such as long service leave. If you choose a service provider who is not registered with the NDIS, you should ensure you are satisfied that they can offer an appropriate level of quality and safeguards. Read more about why you might use a registered service provider. There is information available from NDIS about how to self-manage a NDIS plan and there will be more information about how you can employ your own staff in the Quality and Safeguards framework which is being rolled out in Victoria in 2019. What do I need to know about engaging service providers to deliver my NDIS supports? Can I choose any service provider? Yes, you can choose who delivers your support and services under the NDIS – you have choice and control. However, you can only choose a non-NDIS registered provider if you are self-managing the funds in your NDIS plan. Many providers are NDIS registered. This means they have had to meet criteria set out by the NDIS, including business registration and insurance, and a commitment to meeting quality and safeguards standards. Yooralla is a registered NDIS service provider. You can find other NDIS registered providers on the NDIS website. Why should I choose a NDIS registered provider? If a service provider is a registered NDIS provider, this means they have signed up to the NDIS terms of business and national quality and safeguards standards. Yooralla is a NDIS registered service provider. NDIS registered providers also have to comply with a number of laws, guidelines, policies and service standards, which non-registered providers may not comply with. How can I find appropriate providers in my area? The NDIS has a list of registered providers available on their website. Can I use the same service providers I have now? Yes, you can continue to use your current provider for all or some of the support in your NDIS plan. What do I need to do if I want to continue using my existing service provider when I get my NDIS plan? To continue with your existing service provider, you still need to contact your provider to enter into a Service Agreement with them, before your supports can commence with NDIS funding. What if I don't like the service provider that I choose - what can I do? You can change service providers during your plan. You will need to check your Service Agreement to find out what notice period you need to provide. If you choose to change providers, then you will be responsible for engaging an alternative provider. If you are funded for Support Coordination in your plan, a Support Coordinator can help you do this. A Service Agreement is a contract between you and the service provider, which will outline how they will deliver the supports in your NDIS plan. How can I provide feedback and complaints about my NDIS experience? What if I am not happy with what's in my NDIS plan? If you are not happy with your approved NDIS plan, you can discuss your concerns with your NDIS representative. You can also go through a review process with the NDIS. This process is outlined in your plan cover letter. You can also find out more about the NDIS internal reviews process here. If you are still not happy following the NDIS internal reviews process, you can appeal to the Administrative Appeals Tribunal. What if I am not happy with the NDIA, my plan, or my planner? If you are not happy with the service or support provided by the NDIA, or with your plan or planner, you should firstly follow the NDIA’s complaints process. The NDIA complaints procedure states that you will be called about your complaint within two business days and that it aims to resolve all complaints within 21 days. If you are still unhappy with the outcome of the complaints process, you can contact the Commonwealth Ombudsman. You can also contact the Disability Services Commissioner if you have a complaint about your plan or planner. What if I am not happy with the service or supports I receive from service providers through my NDIS plan? If you are unhappy with the service you have received for supports funded in your NDIS plan, the first step is to follow your provider’s feedback and complaints processes. If your service provider is Yooralla, find out how to provide feedback or lodge a complaint to Yooralla. If you are unhappy with the outcome of the discussion with your service provider, you can take your complaint to a number of different external agencies, such as the Disability Services Commissioner. You can also choose to go directly to the Disability Services Commissioner, or another relevant external agency first.